On Thursday 24 September, 2009, Conference North side Hyde were wound up by the High Court. The Tigers, who had been existence for 90 years, seemed to have reached the end of the road, the culmination of years of financial trouble. A successful appeal against the winding-up order secured the club’s short-term future, but, as the season drew to a close, the club’s longer-term future appeared less rosy. Yes, that’s right, Hyde’s main stand now has a bright, shiny Manchester City badge on it and Hyde’s shirts will now advertise another football club. On the one hand, the club have surely lost its identity and sold its soul to survive. 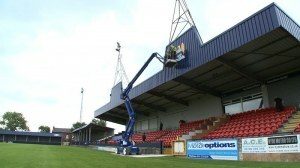 On the other hand, as many users of Hyde’s messageboard point out, the deal puts the club on a sounder financial footing than it has enjoyed for years and, if City move on at the end of the deal, Hyde will be left with excellent facilities, including a new clubhouse, to match their traditionally quality playing surface. Whilst this columnist tends to believe it would have been better to reform at a lower level and maintain independence, the ever-increasing polarisation of professional and semi-professional football in this country means that maybe this is the best practical solution? It will certainly be interesting to see if other clubs follow suit. As someone whose natural instinct is to rail against the ever-growing dominance of the top Premiership clubs, though, I do hope it is not the case. is a Stockport County fan who believes in terracing, cheap entry and going to games. He has no ambition to see his club reach the Premier League, and is quite content to wallow in the squalor of the lower divisions. An ardent believer in the Supporters' Direct movement, he has worked extensively with the Stockport County Supporters' Trust and spends a worryingly large amount of time obsessing over football finance. He now helps to run the County messageboard, and is still in recovery from Luis Cavaco's miss at Middlesbrough in 1997. Shocking, of course, but nonetheless pragmatic. If they can attract City fans to their home games when the Blues are on the road, then maybe it'll be worth it? Leyton Orient do much the same, just less officially. If this arrangement brings a few more through the turnstiles and (more importantly) guarantees the long-term survival of Hyde FC, it will be replicated by others. Informal partnerships between professional clubs and local non-league outfits have been common for some time, and overt sponsorship is surely just a small step further. The crest is a bit much, but it is pleasing to see some of that Abu Dhabi cash going into the grassroots. Most non-league fans also have a league team, and I'm guessing there are a few Hyde fans with Manchester United leanings. I wonder what they think? Personally, I couldn't see myself going to watch Worcester City any more if there was a Villa or Wolves badge on the players' shirts. I understand Exeter City are lining up a similar deal to support Plymouth Argyle in future years?